First, we evaluate the concrete floor. Then we do whatever it takes to create the physical environment required to insure the durability of the new flooring system. Substrate Preparation is critical for long-lasting durability. Blue Field Floors exclusively utilizes superior mechanical means of surface preparation with state of the art equipment, including dust control. Systems selected and installed by Blue Field Floors are tough. These floor systems are designed to withstand continuous abrasion, punishing impact and/or chemical attack. For sanitation our seamless floors are easier to maintain and there are no seams or cracks to trap dirt and bacteria. For safety our floors are available in avariety of textures to help avoid slip/fall accidents. For aesthetics, we offer a rich array of color blends, and patterns allowing for expression and individuality. 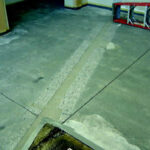 Spray applied Polyurea systems for floor, wall and primary & secondary containment applications including potable water. Installation of engineered fiberglass structures and grating.